The Thunderbird is one of the few cross-cultural elements of Native North American mythology. He is found not just among Plains Indians, but also among Pacific Northwest and Northeastern tribes. He has also become quite a bit of an icon for non-Indians, since he has also had the honor of having automobiles, liquors, and even a United States Air Force squadron named after him. Totems bearing his representation can be found all over the continent. There have been a number of curious theories about the origins of the Thunderbird myth – ones which I will show are probably wrongheaded. In this paper, moreover, I want to examine how the myths and legends of the Thunderbird tie into the sacred clowning/trickster ritual complex of Plains tribes such as the Lakota. I will show how the Thunderbird is intimately connected to this complex, and attempt to explain why. It is the intimate association between these two traditions that may help explain some features of Plains culture and folklore. Aspects of the Thunderbird myth only make sense in light of these associations. Some have looked at the Thunderbird myths through the same lens of understanding applied to European mythology. The Thunderbird is like the Indo-European dragon or ogre or Leviathan, a huge monster who kidnaps virginal maidens, and who must be slain by the brave hero. Or the Thunderbird is simply treated as some kind of fantastic oddity, like the mythical unicorn or mermaid – an impossible construction borne from the extremes of the imagination. Both these attempts at explaining myth lose the important point of seeing Thunderbird as a personification of energies in nature – those found in violent thunderstorms and such – and his crucial dual nature. The Plains Indians believed that everything that was found in nature had a human representative in microcosm. Everything in nature often contained its own opposite polarity, hence the expected existence of beings such as contraries, women warriors, and berdaches. Because the Thunderbird in particular represented this mysterious dual aspect of nature, manifest through the primordial power of thunderstorms, it is not surprising that his representatives were the heyoka or sacred clowns, who displayed wisdom through seemingly foolhardy action. Western thinking has prevented us from seeing the reasons why Indians perceived this connection. Few anthropologists have sought to locate how Thunderbird may have been mythologically linked to Trickster. 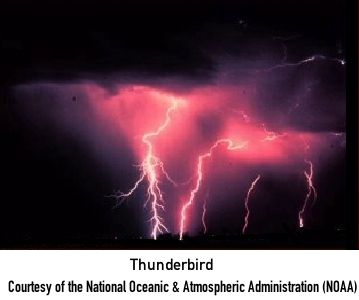 The fact that Thunderbird sometimes appears as something that terrorizes and plagues Indians, and sometimes as their protector and liberator (in some myths, he was once an Indian himself) is said to reflect the way thunderstorms and violent weather are seen by Plains people. On the one hand, they bring life-giving rain (Thunderbird is said to be the creator of ‘wild rice’ and other Plains Indians crops); on the other hand, they bring hail, flood, and lightning and fire. It is not clear where with them worship and awe end, and fear and terror begin. Some Indians claim that there are good and bad Thunderbirds, and that these beings are at war with each other. Others claim that the large predatory birds which are said to kidnap hunters and livestock are not Thunderbirds at all. Largely, I suspect that this dual nature of the Thunderbird ties it to the Trickster figure in Indian belief: like the Trickster, the harm the Thunderbird causes is mostly because it is so large and powerful and primeval. However, the big problem with this theory is that most ornithologists consider it to be quite farfetched. If such a species existed (a situation akin to the folkloric Sasquatch), it would be amazing that to this point it has remained unidentified and uncatalogued. A species of birds that big, unless it consisted of an extremely small number of members, would find it hard to avoid detection for long. Hall does suggest the possibility that maybe, like the mastodon, these large birds were hunted to extinction prior to the arrival of Europeans on the North American continent. Still, the other problem with his theory is that it ignores what Indians themselves have to say about the Thunderbird. They describe the Thunderbird as a spiritual, not just physical, being. It is not seen as just a large, fearsome predatory bird that people tell stories about. Rather, it’s an integral part of Plains Indians religion and ritual. Only by ignoring this fact could we put our Western ethnocentric biases into effect, and reduce it to a zoological curiosity. The Thunderbird is much more than that; the Indian attitude toward it comes from more than just the mere fact that it is supposed to be really big. To understand the origins of Thunderbird myths, it’s necessary to see how they connect with other elements of Indian belief and ceremony – especially the Trickster complex – and see how they fit into the structure of Plains Indian myth as a whole. The age-graded clown societies primarily consisted of older people who had been inducted into their ranks – groups such as the Gros Ventre Crazy Lodge or the Hidatsa Dog Society. These clowns were assumed to simply be playing a role appropriate to their sodality, rather than receiving some sort of supernatural inspiration. They carried out certain expected ritual performances on proscribed days, such as the Crazy Dance or the imitation of animals. In contrast, the military clown societies such as the Cheyenne Inverted Bow String Warriors, often carried comical or ridiculous weapons, but were also expected to show absurd bravery in battle, provoking the enemy into giving up its discipline and cohesion with taunts and insults. Not surprisingly, they sometimes rode their horses backwards into battle. The northern plains clowns, found among tribes such as the Ojibway, wore masks which made them appear to be two-faced, and costumes of rags which made them appear comical. All of these three types of clown societies practiced a sort of conventionalized or patterned sort of anti-natural behavior. That is, they might do something which seemed strange or contrary, but under somewhat regular conditions. You knew when they might do something weird – and there were times when they were forbidden to perform their antics. Further, they might often “give up” the clowning way of life, and return to a non-contrary state by marrying and engaging in a more normal mode of existence. 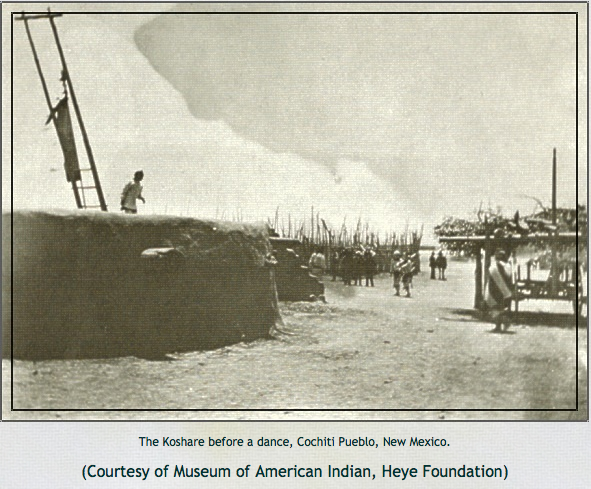 The heyoka were different in three primary ways from the other sorts of clowns. They were truly unpredictable, and could do the unexpected or tasteless even during the most solemn of occasions. Moreso than other clowns, they really seemed to be insane. Also, they were thought to be more inspired by trans-human supernatural forces (as individuals driven by spirits rather than group conventions), and to have a closer link to wakan or power than other clowns. And lastly, they kept their role for life – it was a sacred calling which could not be given up without performing an agonizing ritual of expiation. Not surprisingly, these unique differences were seen as the result of their having visions of Thunderbird, a unique and transforming experience. The Oglala Indian Black Elk had some interesting things to say about the heyoka ceremony, which he himself participated in. Black Elk describes the “dog in boiling water” ceremony in some detail. He also describes the bizarre items he had to carry as a heyoka, and the crazy antics he had to perform with his companions. He also attempts to explain the link between the contrary trickster nature of heyokas with that of Thunderbird. Today, of course, Western physicists describe the dual nature of electricity. An object can carry a positive or negative electric charge. The electron is simultaneously a wave and a particle. Electricity and magnetism are thought to be aspects of the same force, and as is well know with magnetism, it comes in polarities, with opposite poles (north and south) attracting. Though the Indians did not have access to our modern scientific instruments, they are likely to have observed some of the same properties in lightning. Thus it would have been intuitive to link the dual spiritual nature of the heyoka (tragicomedy – solemn joking – joy united with pain) with the dual nature of electricity. Part of the link between heyoka and Thunderbird comes from Iktomi, the Trickster figure. Iktomi is said to be heyoka because he has seen and talked with Thunderbird. Iktomi is the first-born son of Inyan (rock), and is said to speak with rocks and stones. Like Coyote and other Trickster figures, Iktomi likes to pull pranks on people, but is just as often the victim of tricks and misfortunes. This makes him at once a culture hero, and a figure to be feared and avoided. Iktomi was thought to be a hypersexual predator, one who frequently pursued winchinchalas (young virgins) who bathed in streams, through various methods of deceit. Yet his pursuits and antics often wound up with him inadvertently getting hurt or winding up in trouble. Paul Radin suggests that Iktomi and other Trickster figures are akin to the Great Fool or Wild Man of European folklore, who often shows up in the Feast of Fools and other ceremonies where the social order is turned topsy-turvy. (Radin 1956) Jung, following his lead, claims the Trickster as an archetypal part of the collective unconscious; and his “crazy wisdom” as emblematic of humankind’s earlier, undivided, unindividuated consciousness. Iktomi and other tricksters seem to be at the constant mercy of their desires; yet their blind luck always seems to protect them from the consequences of their missteps. He is dangerous primarily because he is so powerful, yet so rarely has the forethought or good judgment to use his power wisely. Radin and others proclaim him the representative of untamed, unpredictably wild nature, within the confines of culture. In other cultural traditions, thunder and lightning are connected with the unexpected. We talk about a “bolt out of the blue.” In American folk culture, there are a host of legendary stories of mysterious cures or transformations wrought by someone being struck by lightning. It’s at once dangerous, and a symbol of sudden, shocking revelation and inspiration. It’s also the primary weapon in most pantheons of the chief sky god (such as Zeus in Greek mythology.) For the Plains Indians, thunder and lightning symbolized the vast, uncontrollable energy of nature. It’s not surprising, then, that the Thunderbird is connected with the strange, uncontrollable force of the Trickster figure, and his avatar, the heyoka. Psychological anthropologists, especially those oriented toward psychoanalytic theory and depth psychology, point to the Trickster figure as a sort of important cultural “release valve.” He represents the “return of the repressed,” the Dionysian aspects of life only temporarily held in abeyance by the Apollonian forces of civilization. The carnivals and feasts held in honor of fools in Europe, suggest some anthropologists, are “outlets,” allowing people to invert the social order temporarily as a way of promoting its continuity in the long run (avoiding its ultimate collapse.) The ruler is dressed in peasants’ clothes, and some ignorant serf is crowned king. Symbols of authority normally held in extreme reverence are mocked and desecrated. More importantly, as a representative of Thunderbird and Trickster, the heyoka reminds his people that the primordial energy of nature is beyond good and evil. It doesn’t correspond to human categories of right and wrong. It doesn’t always follow our preconceptions of what is expected and proper. It doesn’t really care about our human woes and concerns. Like electricity, it can be deadly dangerous, or harnessed for great uses. If we’re too narrow or parochial in trying to understand it, it will zap us in the middle of the night. Like any good trickster, the heyoka plays pranks on others in his culture not to make them feel embarrassed and stupid, but to show them ways they could start being more smart. Lame Deer calls the heyoka the “upside-down, forward-backward, icy-hot contrary.” He describes in detail one particular heyoka trick which may give some clues to the nature of their antics. Apparently, they would grab pieces of dog meat out of a pot of boiling water, and fling them at a crowd of people, without being burned or harmed in any way. (Why dog meat? Lame Deer gives a clue when he says, “For the heyoka, he says god when he means dog, and dog when he means god.”) Lame Deer suggests before doing this they chewed a grayish moss called tapejuta. I suspect that heyoka were able to perform this feat through going into trance, an altered state of consciousness, by utilizing this and other psychotropic plants on occasion. More importantly, I think they induced trance in others through their contrary behavior. Psychologists have noted that trance does not always occur through rhythmic repetition. Another way in which it occurs (the “paradoxical state”) is through a sudden shock to the nervous system. Ethnomethodologists have often noted the blank, glassy stares and strange states produced by violating peoples’ expectations – by, for example, getting into an elevator and facing the other people in it. It’s in such “paradoxical states” that people often may assimilate new information quickly, without filtering. They also may be able to “abreact” psychological trauma. For these reasons, the heyoka may have been seen as a source of wisdom and healing. The Thunderbird’s association with heyoka clowns is not simply serendipitous. The fact that the Thunderbird displays many paradoxical and contradictory attributes links it to Trickster figures and to the contraries of Plains Indians culture. This culture complex probably resulted from Indian beliefs about nature and the ways in which thunder and lightning exemplified the manners in which it could be at once capricious, beneficent, and destructive. The Thunderbird’s own link to the original Great Mystery suggests that the role of the sacred clown was seen as one of the highest in Plains society – like wandering fools in Europe, they were thought to be touched by the Divine power itself. Like Thunderbird himself, the heyoka was thought to be a conduit to forces that defied comprehension, and by his absurd, backwards behavior he was merely showing the ironic, mysterious dualities that existed within the universe itself. Edmonds, Margot, and Clark, Ella E., Voices of the Winds: Native American Legends , Facts on File, New York, 1989. Erdoes, Richard, and Ortiz, Alfonso, eds., American Indian Myths and Legends , Pantheon Books, New York, 1984. Fire, John, and Erdoes, Richard, Lame Deer: Seeker of Visions , Washington Square Press, New York, 1972. Gill, Sam D., and Sullivan, Irene F., Dictionary of Native American Mythology , ABC-CLIO Inc., Santa Barbara, 1992. Hall, Mark A., Thunderbirds: The Living Legend of Giant Birds , Fortean Publications, Minneapolis, 1988. Hines, Donald M., Ghost Voices: Indian Myths, Legends, Humor, and Hunting Stories , Great Eagle Publishing, Issaquah, 1992. Hultkrantz, Ake, Native Religions of North America , Harper & Row Publishers, San Francisco, 1987. Neihardt, John G., Black Elk Speaks , Simon & Schuster, New York, 1959. Radin, Paul, The Trickster: a Study in American Indian Mythology , Greenwood Press, Westport, 1956. Steiger, Brad, Medicine Power , Doubleday & Company, Inc., Garden City, New York, 1974. 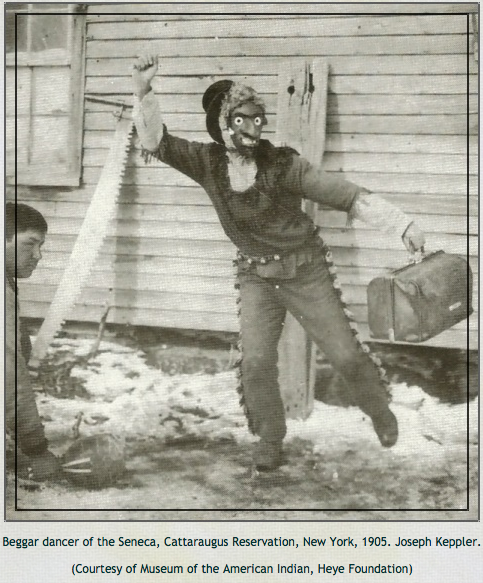 Steward, Julian Haynes, The Clown in Native North America , Garland Publishing, New York, 1991.